(St. Louis, MO) June 29, 2015. The Institute of Packaging Professionals (IoPP) reviewed almost 100 entries for all types of packaging including food, beverage, pharmaceutical, health & beauty and chose Anchor’s Embraceable as a winner of the 2015 AmeriStar Design Excellence Award. All entries were judged on innovation, product protection, economics, performance, marketing, and environmental impact. IoPP’s AmeriStar Package Awards Competition recognizes those companies changing the face of packaging and is considered North America’s most prestigious packaging awards competition. This is the second award for the Embraceable package and it joins a list of other awards won by Anchor Packaging products. 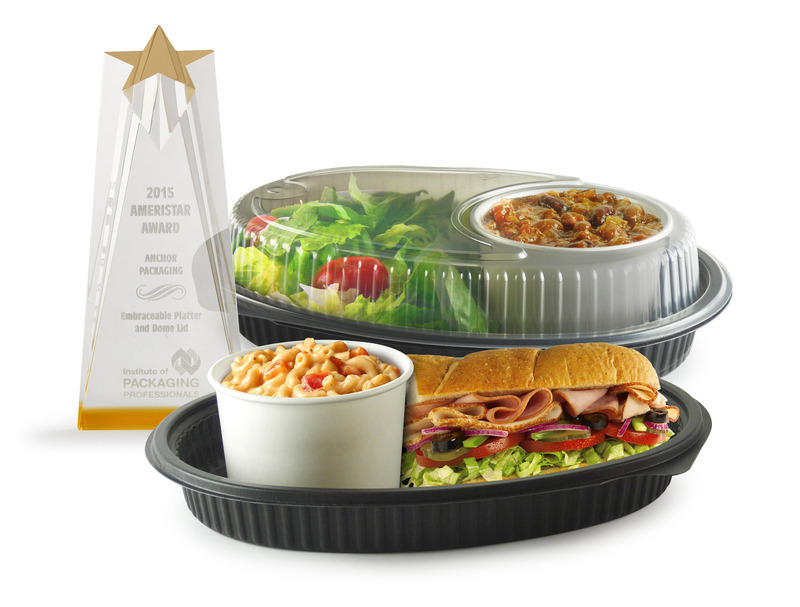 Embraceable is an 11” x 8” black, oval platter designed and patented with a locator ring in the bottom to hold a standard 8 ounce squat paper food container. This popular serving size is used for chili, soups, oatmeal, grits, mac & cheese, and many other items that often accompany a main dish, sandwich, or salad. The clear, anti-fog, vented PP lid contains an integral sealing flange that forms a lid over the paper container at the same time that it forms a leak-resistant seal on the platter. This eliminates the lid for the paper container, which saves expense and reduces the amount of packaging consumed, thereby reducing carbon footprint. It also improves consumer convenience, as the meal may be carried in one single container, rather than two. Both base and dome work well for hot foods held under heat lamps, chilled ready-to-heat meals in the microwave, and for assorted hot and cold food applications, thus reducing SKUs. The strong and durable, cut-resistant black PP base withstands temperatures up to 230°F. Bases are made with natural mineral additives reducing the use of petroleum based resin by 40%. Elimination of the extra lid for the paper container also demonstrates your environmental commitment to reduce waste. Anchor Packaging’s products include affordable, upscale, takeout packaging. Anchor’s products are used for merchandising prepared ready-to-heat meals in supermarkets, and takeout meals offered by restaurants and other foodservice operations. Anchor’s unique product line includes stock and custom rigid packaging, as well as a broad line of cling film wraps.